Provision of Hope first began assisting refugees in the Buduburam Refugee Camp in 2003. We started by helping “the one”: our Liberian daughter, Felecia Davies, who we later brought to Canada. At the time we met, she was facing severe challenges. Today she has a powerful story to tell of how God rescued her from the depth of poverty and spared her life through the war. 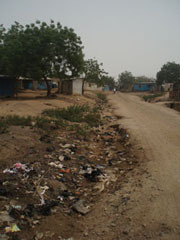 The Buduburam Refugee Camp is located 44 kilometers (27 miles) west of Accra, in Ghana. It was opened by the UNHCR in 1990. This camp is home to over 35,000 refugees who sought asylum during the Liberian Civil Wars. Since the UNHCR ended their services in the camp in 2007, Buduburam is mostly served by NGO and volunteer organizations. Life is very difficult at this camp, with much hunger and need. You will find open sewers everywhere and so much disease. People pay for everything: even their drinking water and toileting. Rice has gone up to $50.00 a bag. The people here are unemployed and the suffering is great. Most of the population is dependent on handouts from people abroad in order to eat and survive. Provision of Hope works with over 100 single mothers and their children. We have started a Single Mothers Empowerment Program where we empower these women to operate small businesses in order to provide the basic needs for their children. It is amazing how this has given them a sense of self worth and confidence. Above left: The leaders of our Single Mothers Program: Leona Wleh, Linda Jarbah and Beatrice Williams. Above right: A photo of some of our mothers and their children. Everyone is desperate for help! We continue to help the people to resettle back to Liberia. We have helped many individuals and families relocate, as in the photos below. We have been very successful in locating family members after years of separation. We have one story after another. What a joy to see them together! Photo on left taken at the Buduburam Camp; photo on right taken after they are resettled back in Liberia.